We broke the record set by Hop Butcher for longest podcast during a 10 hour brew day. Sit back and relax and strap it in for a 4 hour and 10 minute marathon as Jake Edwards and I brew the podcasts first collaboration beer at Lake Zurich Brewing. 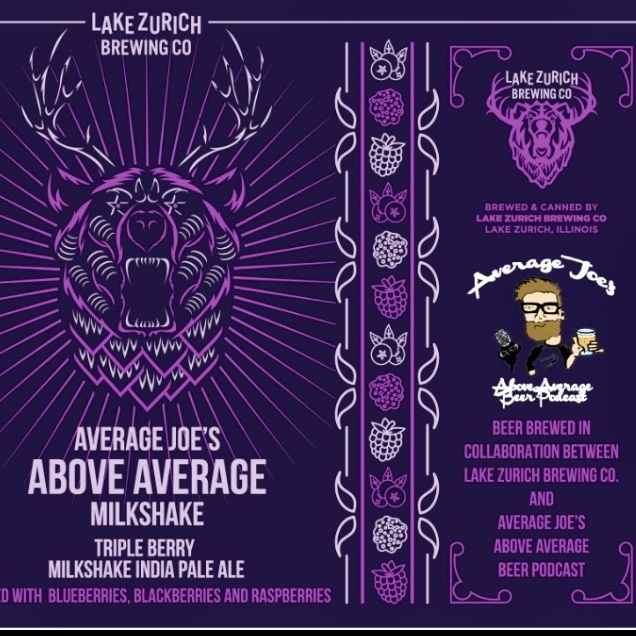 A Triple Berry Milkshake that should be hitting bottle Shops and the LZB taproom in late April/Early May. We really covered some ground on this one, we even got a special appearance by James O'Brien from Flesk Brewing. My first Mead episode. Clint welcomed me into his cozy spot in downtown Valpo, IN and schooled me on the mead game. I probably could have talked to him for 8 hours and barely scratched the surface of Mead brewing, but we were hungry and need some Ricochet Tacos! This was an amazing experience for me and Im all about the mead at this point. It is coming on 04/20/19, Mad Hatchet Brewing will be opening its doors to the public! I got to sit down with my old friend Mike Fosnaugh better known as FOZ, who will be their head brewer, along with their Owner and Brewer Mike Stevenson and Assistant brewer Sean McTighe! We talked about what led them all on this path to opening a brewery and what they can expect when they get going. I got to cruise up to Elk Grove Village to hang with the Mikerphone crew and check out the new Blue Room, the canning line, and preview this years Smells Like a Beer Fest! It is always a great spot to visit. The first 20 minutes we have the whole gang together, but then Mike Pallen has a fire to put out, so we recorded more of a one on one which is directly after the first 20 minutes, and then after that you get a half an hour of bonus content with Kyle and Mike W. CHEERS AND ENJOY. Kinds new and kinda old at the same time. A lot of people may remember the brewery as Myths and Legends or Urban Legends in Westmont. Well since 2018 it has been known as Whiskey Hill Brewing and they are kicking out some badass beers. They are doing great old world styles while bringing the creativity with big NEIPA, Pastry Stouts, and Fruited Milkshakes or FLOATS! The atmosphere is great and the people behind the place are really fun to talk to. My fellow Leatherneck, Matt, Headbrewer Jon, and JJ were amazing hosts and provided me with a bunch of good stories and pure entertainment. Nice to have a class and intelligence on the show for once, but enough about Alex Lovinggood and his Pit Vipers. Danielle and Katie brought the knowledge on the podcast. I frequently found my eyes glazing over trying to keep up with Danielle's well thought out explanations to my moronic questions. This is an impressive group and they do so much for the Illinois Craft Beer scene, which is now widely considered one of the best 2 or 3 beer scenes in country. From Springfield government shenanigans to FoBAB, the work never stops, so sit and listen and get to know these cats! And get ready for Alex Lovinggoods new podcast coming soon "The Maker in Me"
Feeling lucky to have Shaun Berns and Evan Morris share their huge news on my little podcast. They are finally stepping out on their own. They sent out some cryptic social media the day before recording and then share all the dirty little details with me! Days like this are why I started this podcast in the first place. Can not wait to watch them grow. Happy international Women's Day 2019! Emily Slayton, Owner and Brewer at Skeleton Key Brewery in Woodridge was kind enough to let me be a part of this awesome collaboration brew day extravaganza. They made a Lithuanian style IPA with a yeast strain brought to America by Omega Yeast Labs of Chicago. It was a great day that was enjoyed by all the participants and the patrons of Skeleton Key. Look for the beer in early April. My friend John Brand makes his 3rd appearance on the show, this time showcasing a new brewer at the southside brewpub, Wil Turner. A man who has been in the game as long as anyone in Chicago, making great beers and moving it forward while paying homage to the classic styles. We had a fun conversation over some cheese curds, Wil's homemade beef jerky, and some tasty beers. Gotta love that southside baby! What a stunning place to have a beer in the burbs. Every detail mattered on this one. Just has the feel of a Northwoods tavern meets an old Irish Pub. The wood work, layout, and atmosphere are insanely cool. They are young but they will be a powerhouse summer spot.